Showing results for tags 'wipe patch coming soon'. Information on the forthcoming patch to live servers. Captains. Wipe patch is coming this month. The following content will be deployed to live servers. The deployed content is going to be more stable as it was properly checked on the testbed servers by a QA team and our amazing community volunteers who spent a lot of time on the testbed and provided a lot of feedback on bugs and improvements. Estimated time of deployment of the patch is between 15th May and 24th May. We are testing the Nation change item (Forged Papers) now that is absolutely critical for the problem-free delivery of the wipe patch. Here is what you can expect in the patch to live servers. New changes: Combat model updated. Structure introduced. Ship now receives structural leaks when structure goes down (not when armor is destroyed like before). Structure affects leaks and masts integrity (you will be able to demast by bow and stern raking). Port battle entry is only allowed 30 mins after login at sea. This penalty can be dropped if you enter any port. If you log off at sea and login within 5 mins (disconnects etc) you don’t get that penalty Zone control points are not accumulated during first 10 mins of the port battle, zones cannot be captured during first 10 mins of the port battle. New sounds system is implemented. Crew responds to your actions and intensity of combat. All ships now have 1 durabilities with the corresponding change of required resources. You can now use the hold of your fleet ships. New perks are introduced for fleet management Admiralty store has been added. The following rewards were added (names are temporary and might not survive) PVP marks - for high end frigates permits and skillbooks PVE marks - for certain ships, skillbooks, resources and some other items Conquest marks - for port battles and permits for lineships Trading Manifest - reserved for potential future use. Each reward can be used for exclusive content in admiralty stores. PvP/PvE rewards are given in the end of battle based on battle kills and damage. If 10 people sink 1 ship rewards are split for 10 people based on damage, kills and assists. Conquest rewards are given for victorious port battles for attackers or defenders and only if they inflicted damage on enemy ships or infrastructure (forts and towers). Officers. Officers had one problem, they punished you if you played actively (and sank a lot). As a result officers were removed from the game and all perks have been moved to a player. You get 1 point per rank. Officers in their traditional sense might come back in the future. Perk reset cost introduced - to reset your character perks you have to pay 50 PVE marks. Pirate vs Pirate - outlaw battles. Pirates can now attack each other. The battle created by pirates vs pirates is always open and has FFA rules (free for all). You can sink anyone you see. Signalling perk does not work in the battle. Battle cannot be created in the capital protected waters. Outlaw battles do not give rewards. Recently killed tracker added to game. Players who recently lost the battle (sank or surrendered) no longer give rewards for 1 hour. This solves a number of problems with pvp rewards farming Ship paints can now be stored in clan warehouses. Chain shot damage fall off from distance implemented and added to game. Removal of current upgrade system and ship quality level. Tiered ship knowledge is implemented. (Details) Repairs changed. Repairs now can be crafted and carried in the hold. You can use your fleet to carry more repairs. Cooldown is implemented on repairs. The number of how many times you can repair in battles depends on your hold size. You can capture repairs from enemies Hold management in instances added, hold management for fleets is revamped. You can now use holds of your fleet in battles and capture hold from boarded/sinking enemies. Bot routes and npc fleet composition significantly improved. Guns are now sold in units and can be crafted. Rookie zones removed. Rookie capitals are added back to respective regions. (Details) Assign crew functionality in instances updated and somewhat improved. Resource transport between free towns removed Ship transport between outposts removed Teleport to freetown removed. Outpost to outpost transport is now only available between national towns. Tow to capital replaced by tow to port - which sends you to the nearest deep water port - this is done to allow players living in distant areas from the capital to have unstuck that does not send them across the map (forcing them to sail back). Certain changes are done for trading resources production limits. Expensive trading resources are no longer produced up to 25000 items providing infinite money making opportunities (e.g. textile machinery) Shipyard is added back and is a required building for ship crafting Lineships blueprints are now available in the admiralty. Lineships require permits to construct Gifted perk removed Ship blueprints no longer drop when crafting as there is no more RNG in crafting. Blueprints are immediately unlocked based on your crafting level or can be bought for marks from the admiralty. Antigriefing is now based on curve - not on fixed number (old number 5x). The paramteter changes based on the amount of ships in the pull zone. If you want to attack a large organized fleet you will have to have a lot of ships too. Solo line ship can be attacked by a very small force. Minimal crew thresholds for all vessels are now 70% of max ship crew (only checked in port) - you still can use under crewed ships in battles though. This requirements is not valid for trading vessels. Hold load now affects speed and acceleration both in the Open world and in the battle instances. Cannons affect hold load as well. . Contracts on cannons can be placed in stores. Medkit was replaced by RUM. Surgeon now needs rum to fix sailors (or cut them). Medkit blueprint eliminated. Battle result screen removed. Can stay up to 15 minutes inside the battle after it is over. Player exiting battle spawns in the open world. If you alt-f4 in battle you will be sent to the OW after battle If you exit the battle and do nothing - normal disconnect mechanics will apply. You can now loot hold from sinking ships if you are near the sinking enemy vessel. NPC Ship capture on the PVP server From now on All NPC ships cannot be captured on the PVP server. You can still take their hold and loot but you cannot switch to an NPC ship anymore. 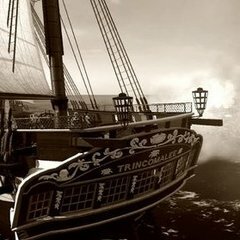 PVE Server: NPC ships will be capturable on the PVE server with no restrictions. PVP Server: On PVP server you will only be able to capture ships from players. Player fleet ships are considered pvp ships and can be captured This fix also change closes final loopholes on pvp marks farming and provides guaranteed market to shipbuilders Alliances tab disabled temporarily until alliance rework Shipbuilding overhaul. Governors of regions announced a monopoly on all woods except for oak, fir and lignum. Imported resources (like teak) will only be available in the regions that imported them historically. Other woods will only be sold by NPC traders in the region. (Details) New planking trims added to game. Redundant trims removed New wood types added to game Invisibility added when exiting battles under following conditions Both Sides will receive 1 min invisibility on exit. You cannot be attacked or attack during invisibility. Invisibility persists even if you die and spawn in port (lets say Free town) Cannons can now be stored in the warehouse Tunings: Map zoom increased 2x in commander tablet Port battle time increased to 105 mins Accuracy and damage from land based guns increased by 15% Points for kills increased by 50% in port battles instances Attack circle timer (ow attack) reduced from 20 seconds to 15 seconds If you sink in battle you will still be able to see the compass and wind indicator Brace command is now a toggle All contracts that are more than 15 days long are going to be automatically cancelled from now on. All instances are now immediately closing when last player leaves the instance. A good % of instances were wasted for bot vs bot entertainment Forts and towers were significantly buffed (large fort will destroy a ship in approximately 5 minutes under constant fire). We hope this feature will help players to vary their fleets a bit and bring mortar vessels to battles (who can destroy a fort in 10 mins. If this damage is too big we will lower it, but we were not really satisfied with the forts uselessness in battles). Military NPCs now sometimes drop repairs as loot Sugar added to many regions as resource - for rum production Boarding preparation growth increased Perk points are given to player faster - you will get 10 perk points 2x earlier. Crew requirement lowered on 4lb,6lb and 12lb carronades Tow to nearest deep water port do not check the hold weight any more Redwood logs abandoned; blueprints using redwood now use lignum vitae. Pine is merged with Fir and is now Fir from today. Pine logs abandoned, blueprints have changed Fire damage is increased by 25% Split function is improved Bow figureheads rebalanced slightly (some bow figureheads might get abandoned though based on the historians feedback) Fixed Rattlesnake figurehead bonuses bugs Added a tooltip to cannon crafting blueprint Port crew recruitment is now 68 per crew member. You will have to use rum at sea. 1 rum recovers 1 crew. PVP content in the admiralty store rebalanced. PVE server will have different prices and mark conversion options Fleet and fort kills are properly counted to your fleet if you did the most damage Added a button to sink a ship during cargo transfer interface (to receive kills and assists) When instance ends all hulls with white flags left in instance are sank and give rewards to players who were supposed to receive kills for them Recently killed flag is not given if you were sank by NPC Certain tuning is done for Carpenter and Steel toolbox (bonuses reduced) Repair cooldown increased from 10 mins to 15 mins (might get reverted back as we want to promote more aggressive combat) Minimal crew requirement lowered on all traders Victorious port battle defenders now properly receive conquest marks. To receive conquest marks you have to damage any enemy ship (any ship even one ship) above a certain threshold. Empty port battles will not give conquest marks. Conquest mark distribution. 3 for lineship ports, 2 for frigate ports, 1 for shallow ports. It now takes some time to destroy stacks of resources in your cargo. This will allow privateers to get some cargo if they tag the trader in time. You can only destroy one stack in 25 seconds Copper mine building removed, copper removed from all blueprints. Ship blueprints updated and now require provisions. Ships in general became more expensive to make (especially higher level vessels) Changed NPC production limits on certain resources Port battles now properly allow PB battle points for recently killed captains (including pvp marks) Fixed bugs: Ship reverse speed bugs fixed Trade window bug fixed (players lost their ships they traded via trade window) Cargo duplication bug fixed Fixed bug that did not allow to access hold for NPC ships in missions and events Fixed bug that allowed to receive marks for basic cutter Fixed bug that allowed your sank vessel to magically appear in the BRS screen Fixed a memory leak with open combat information window. Fixed UI bugs in ship to ship transfer Bug causing blueprint drop during breakup removed Fixed most bugs not giving rewards for sinking surrendered ships Shipyard and workshop resource requirements bug fixed. Several instance crashes bugs fixed Fixed bug that did not allow you to craft even if you had a free slot in the port Fix bug that shown the pve/pvp marks conversion rate for knees and furnishings Fix bug that made captured derelict disappear if their owner exited the battle before assigning crew to them (to allow their capture for others who are still in instances) Fix bug that allowed ships added to fleets without the perk in outlaw battles Fixed several bugs with hold informational updates Fixed bug that allowed bots to repair guns indefinitely Fixed bug that increased deceleration on the Cutters A lot of minor bugs fixed One more hot fix will be deployed to the testbed before the wipe patch, the team is fully focused on the delivery of the wipe patch to live servers. this topic will be updated with clarification and cross links to detailed information on some of the issues mentioned in the notes.